The Announcement from Branch Basics — janny: organically. If you purchased Branch Basics as your do-it-all soap concentrate, you may be getting an announcement about this, but rather than play defense, I decided to be upfront about my knowledge of the matter and how it played out from my end. This past December, I traded emails with one of the founders of Branch Basics regarding a claim about their company and formulation. Furthermore, it was brought to my attention that a chemistry-smart blogger did her own tests on the formulation based on the ingredients provided (some were kept proprietary by their formulator) and concluded Branch Basics had to have some sort of synthetic detergent included. The blogger also admitted Branch Basics may not even be aware of this. And indeed they were not. After pressing, their formulator finally admitted to using synthetics. 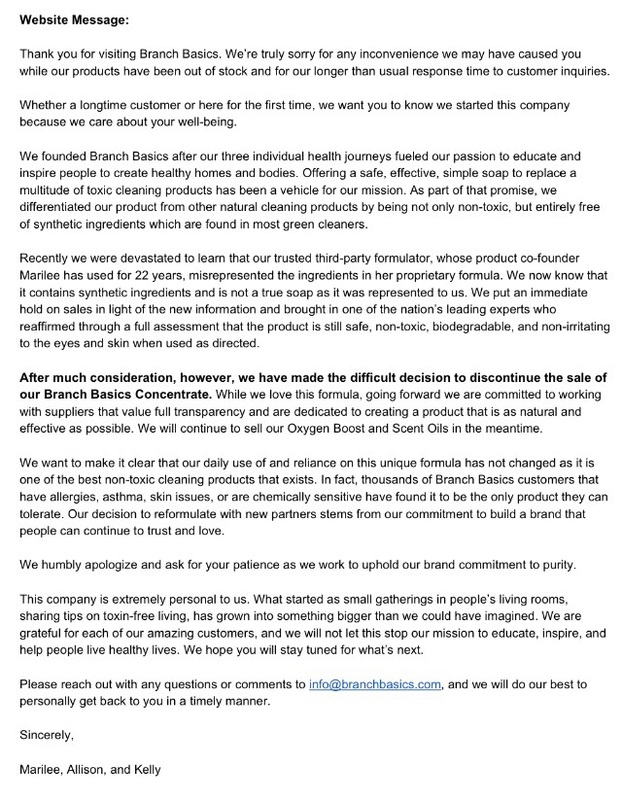 Branch Basics immediately put a hold on all product sales and launched their own investigation by bringing in a third party, a leading toxicologist, to test their formulator's product. Preliminary tests concluded the formula is a "combination of biodegradable ingredients and it is considered to be safe, non-toxic, non-irritating to the skin and eyes when mixed and used as directed, and not a dermal sensitizer, not carcinogenic, not a reproductive risk and not bioaccumulative." Because the formulation does include synthetics, even though it is safe, Branch Basics will be discontinuing the formula while they create a fully transparent product that is effective and as natural as possible. Because I can attest to the character of the founders of Branch Basics, I believe they were not aware of the synthetics in the concentrate. Their humility and transparency with me over the past two months has been evidence of their care for their customers and commitment to safety and purity. I wanted to write this to anyone who may have bought Branch Basics based on my recommendation and I hope you don't feel you have been misled in any way. I believe the product to be safe and will continue to use the concentrate in my home as I have before...from detergent, to hand soap, to jewelry cleaner and everything in between. Not all synthetics are harmful, as concluded by the third party testing. I look forward to working with Branch Basics new product as soon as it is available.